I hope your 2014 is as cool as this picture. I just wanted to say take the time to wish all of you a warm and happy Christmas and prosperous new year. 2013 is a year that I'm mostly happy to see the back of with the exception of rhis site, each year it grows into a more and more positive experience and is a steady provider of joy for me. That's mostly because of you, the wonderful folks who read, comment and help out around here. I'm very thankful for the many friends I've made. To paraphrase from the great Daniel Roebuck, I used to collect toys but now I collect friends. Thank you to everyone for your comments, kind words and most of all for making me laugh.. Thank you to everyone who bought Rack Toys, the support for my first publication was incredible and intoxicating, I am in your debt. Thank you for checking out PodStallions and being so gracious with your input and comments, they are all the reward we could hope for. Most of all thank you for getting the spirit of Plaid Stallions, it's wonderful to put positive energy into something and see it pay back ten times over. The internet can be a negative place and it's so heartening to see it go the otherway so naturally. PS: I'm taking off for a few days for obvious reasons, we'll return in the new year with a new Podcast, the retro awards and a new book announcement. See you in the future! It seems fitting to end a month of Wish Book pages with what I consider the greatest one ever. 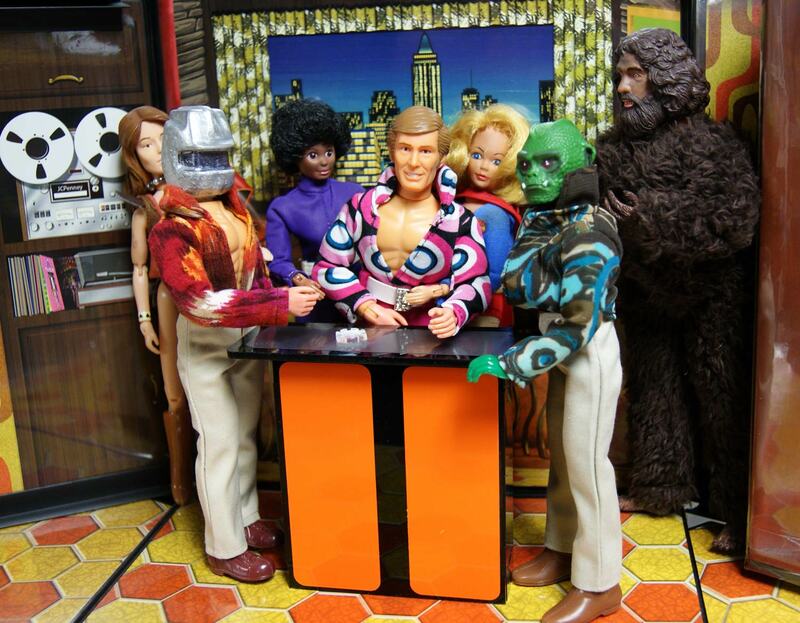 From Monkey Wards 1976, the Mego Superheroes battling the Lincoln Monsters. It's not my favourite because of childhood (we didn't have Wards in Canada) but when I was a teen tracking down my childhood monster friends, I could never find them. 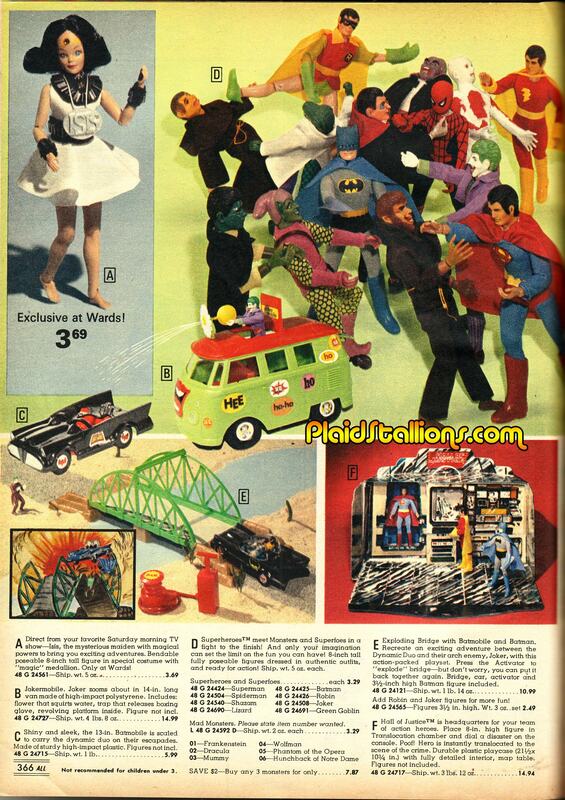 In the pre-internet days of collecting, I'd plow through toy shop or comic buyers guide and get people trying to sell me AHI and Mego monsters but I knew they weren't right. 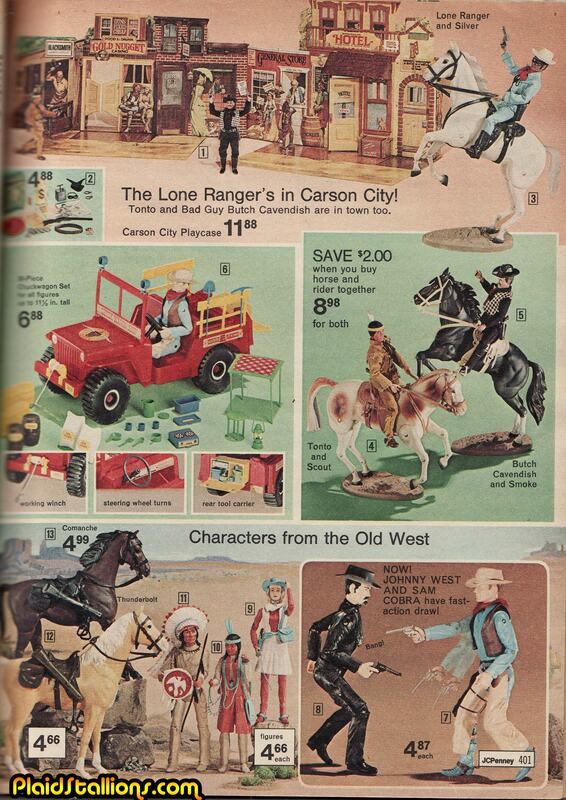 Although they were far past prime, Western action figures were still very much a viable commodity in the 1970s. I'd even be willing to argue that Gabriel's seminal Lone Ranger line may be one of the top ten action figure lines of the 1970s. 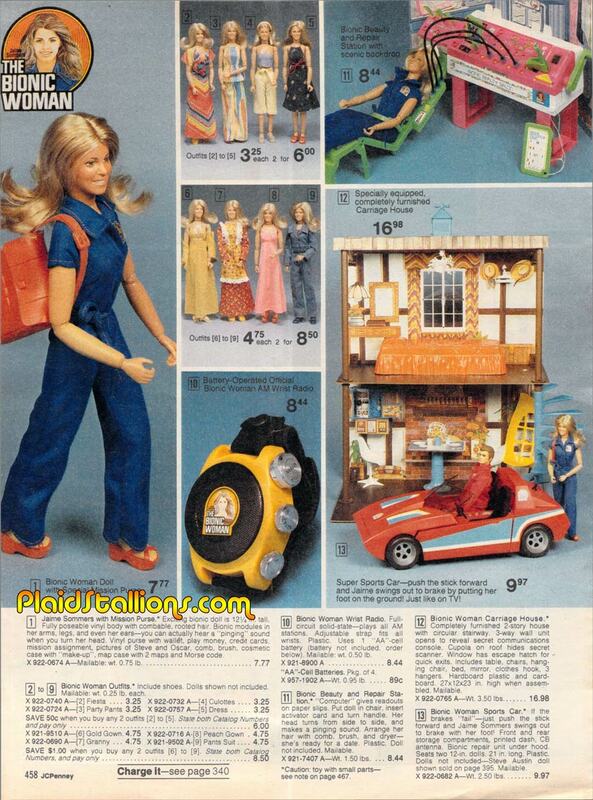 It would be silly to discuss Christmas in the 1970s without talking about one of it's most popular toys. 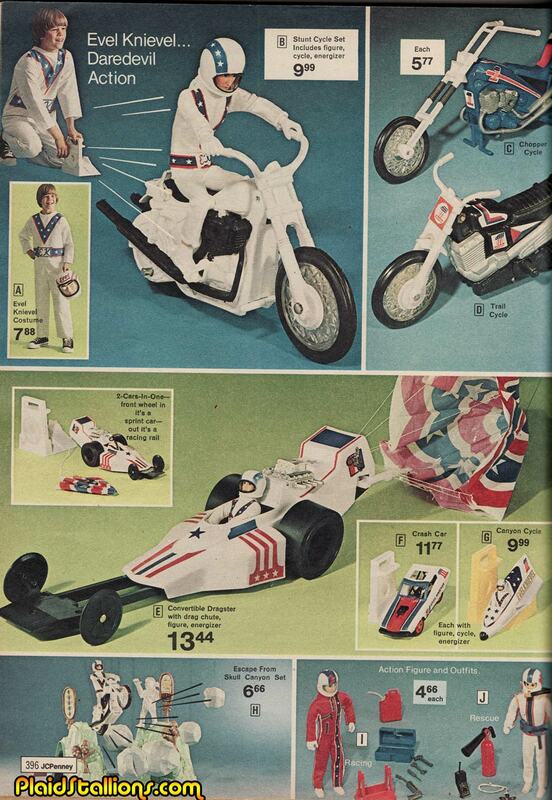 The Evel Knievel stunt set seemed like a license to print money until a certain incident (you know..bonk! bonk!) ceased it's production. 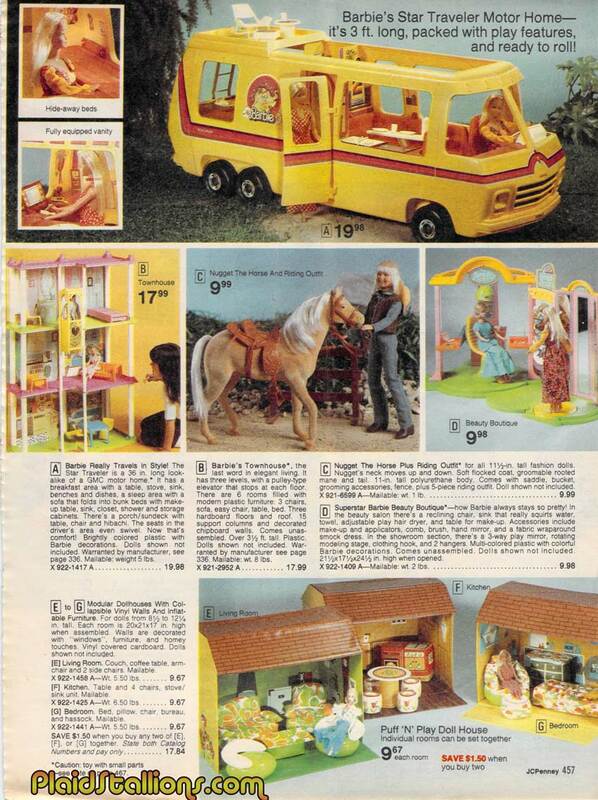 It's December and we wouldn't even have this site if it weren't for the 70s Wish Book catalogs that magically landed on our door steps every fall. 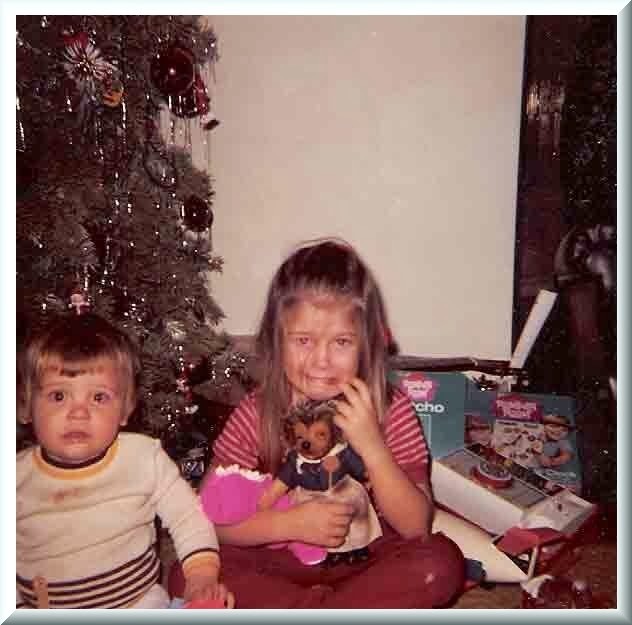 Episode 11 is dedicated to our crazy 70s Christmas memories, the letters to Santa, the arms length wantlist and how Star Wars just turned the whole thing into "Space-Mas". 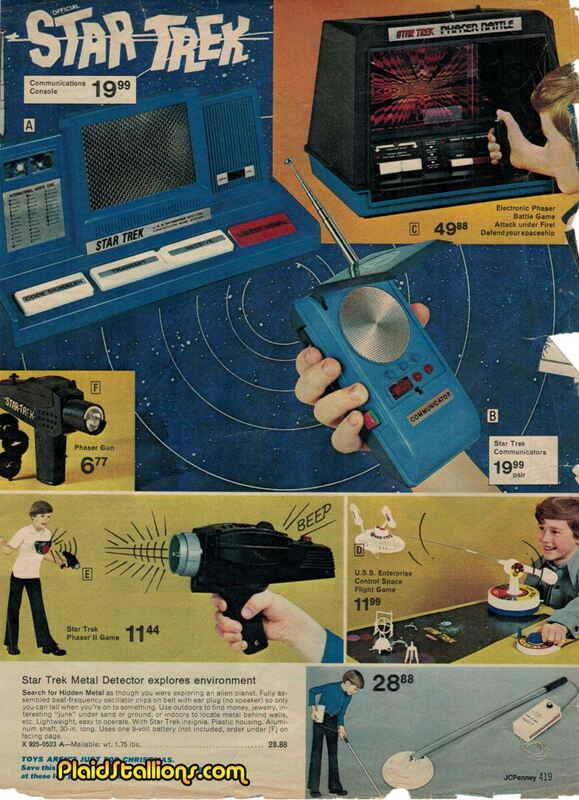 The discourse is mainly about traditions, toys and of course, collecting. It always boils down to that. A letter to Santa (AKA Brian's grandmother) in 1979 was perhaps a bit too meticulous. While Mattel Shogun Warriors were high on both of the guy's wish lists, only Jason got one. Jason had the wonderful Star Bird by Milton Bradley. Both of the guys had Bulletman the human bullet. A 1977 article about the Kenner Star Wars early bird kit. 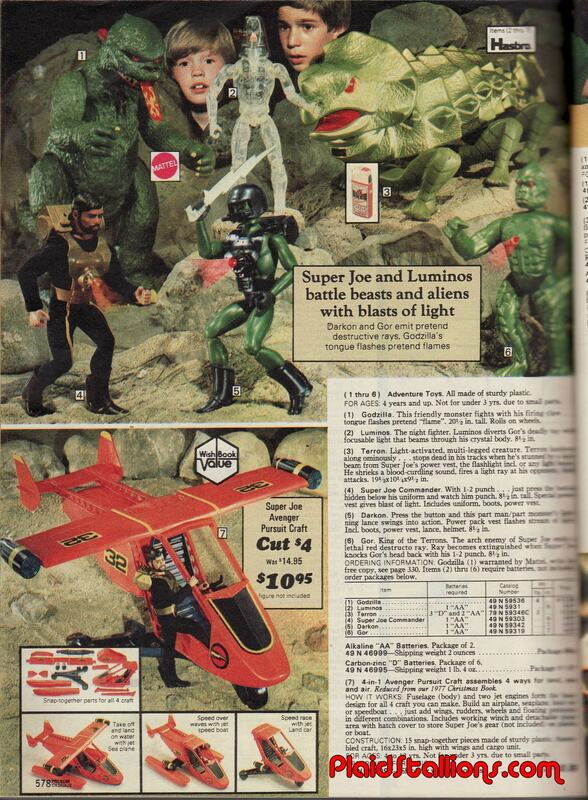 Mattel's Flying Aces was another toy memory from Jason. Pulsar was a toy denied to Brian as he was deemed "too gross". 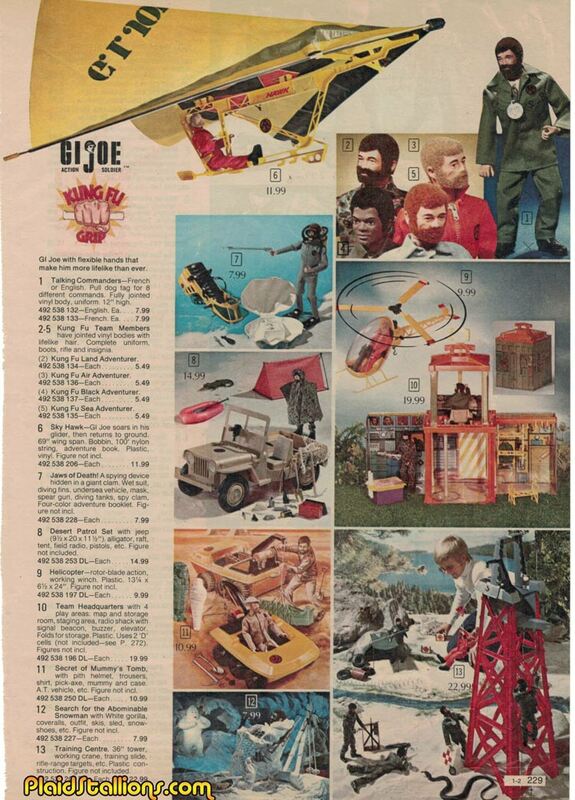 The Kenner Six Million Dollar Man line is a particularly happy Christmas memory for Brian. The Batman viewmasters were in Brian's stocking in 1975. Jason fondly remembers the Spider-Man/Captain America ricochet racers. Seeing all the Doctor Who merchandise in main stream stores this Christmas makes me nostalgic for the time when all Sci Fi shows were marketed towards kids. 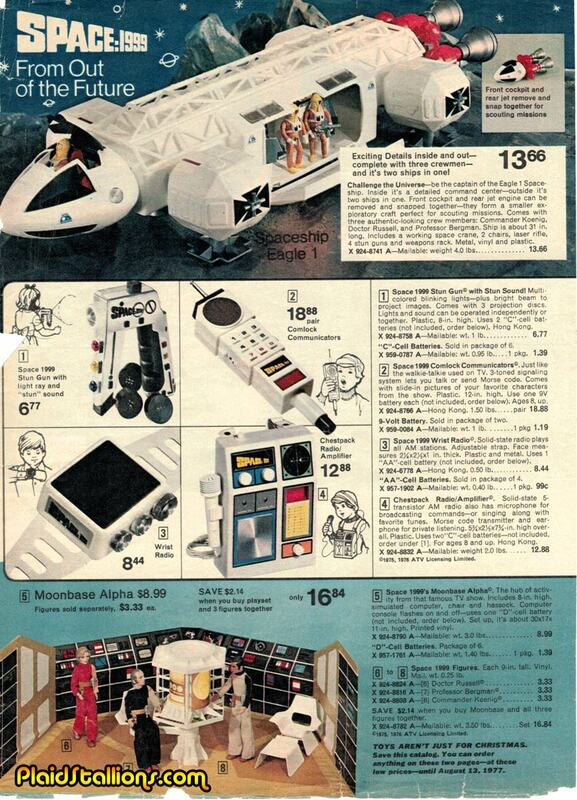 Space:1999 mania was in full swing in 1976 and it produced buckets of memotable merchandise. That big Eagle is still something I plan on reacquiring in 2014..
On the other side of town, Star Trek was in a golden age. I really feel sorry for the Star Trek metal detector kit. 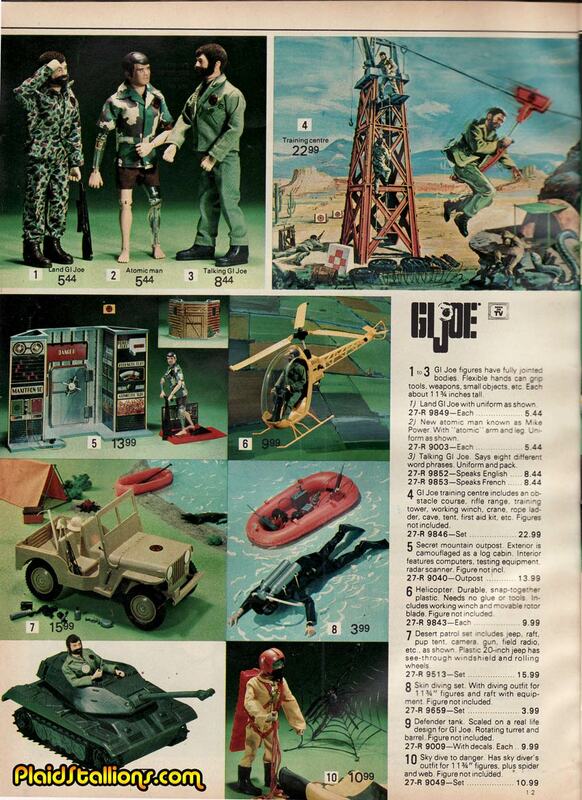 It's true, I loves me some GI Joe. While I have no room to put it all, I sure like to window shop. 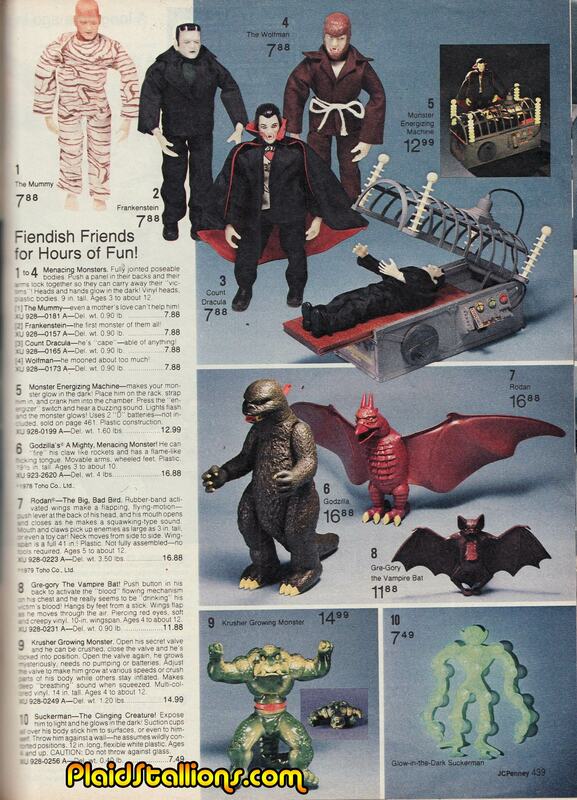 This page is from the 1975 Eaton's catalog and I'm pretty sure I burned it into my brain that year. Joe's world (and packaging artwork) has always captivated me and 1975 was a super special time for me...mainly because I was five. Atomic Man was a childhood favourite of mine (though the appearance of Steve Austin did diminish Mike's appeal) and Sky Dive to Danger (the set where Joe lands into a giant spider web) will forever be my favourite GI Joe set of all time. 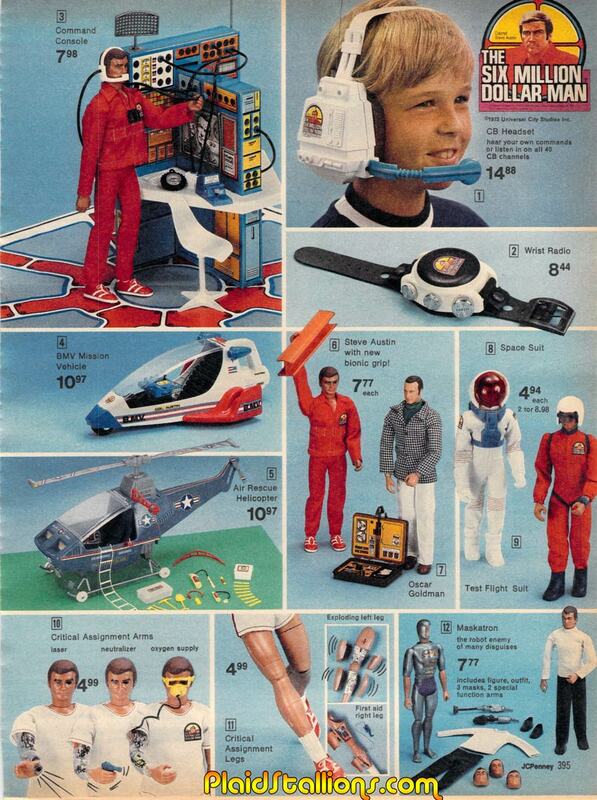 Christmas will forever remind me of the Bionic Man, mostly because he or his friends were a staple from 1975 to 1978. 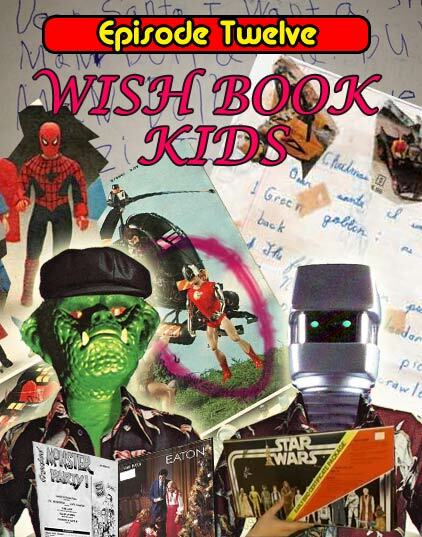 I didn't get everything on this page but I had Steve, Oscar and Maskatron and I played with those three for years. I would feel remiss if I didn't extend the Bionic Monday spotlight to the Bionic Woman, a show my sister watched loyally (I'd watch the Fembot ones or when Steve did a guest star/crossover). While I personally never had any of this stuff, I remember how big a deal it was on the playground. Toronto, ON, Canada (Dec 12, 2013) – Following his new animated web series, Canada’s own iconic champion, Captain Canuck gets the action figure kids have been looking for since his debut in 1975 with a new release from Odeon Toys. He's been on a postage stamp, even the cover of Time, but for decades, Superman had one thing over Canada's Superhero… an action figure. Canadian toy maker Odeon toys in creative partnership with EMCE toys and Big B Comics are righting that wrong. 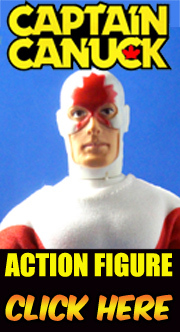 The 8 inch tall figure which will retail for $24.99 will have the look and feel of a toy released when the first issue of Captain Canuck, by creator Richard Comely, hit news stands in 1975. "We were looking for an iconic Canadian character for our first release, and I can think of none better than Captain Canuck, " said Sam Noir, project coordinator at Odeon. He added "I was one of those kids who looked for a Canuck figure on toy shelves in the 1970s, I must admit, we're pretty excited to be doing this." The Captain Canuck figure will be available in 2014 at Big B Comics (www.bigbcomics.com) locations and online at www.megomuseum.com andcaptaincanuck.com. founded in 2012 by Fadi Hakim and Alex Sengupta. 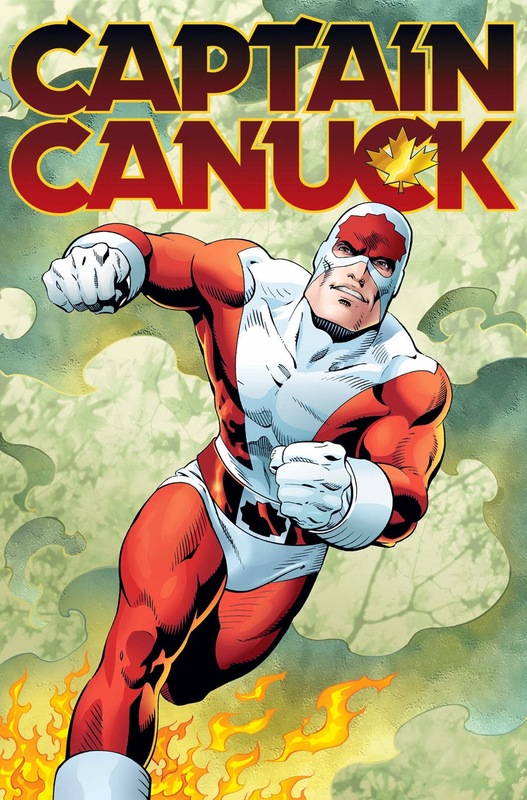 Entrusted with Richard Comely’s patriotic creation, the partners enlisted television industry veterans Dean Henry and Paul Gardner as Creative Directors to re-imagine Captain Canuck for a new audience. Odeon Toys produces action figures and collectibles outside of Toronto ON. Formed in 2011, the company's first release were the Mego Museum Super Collector and Brick Mantooth : the Plaid Stallion action dolls.